With an annual turnover of more than €1.8 billion, Globus Baumarkt trade stores are one of the most prominent home improvement retailers in Europe. This DIY company distributes its extensive product range in more than 90 physical stores and 4 online shops. Whether in e-commerce or in stationary markets, the strategy of this DIY giant focuses on customer satisfaction. In order to meet customers’ demands – over 1.5 million visitors per month – in their online shops, Globus Baumarkt turned to the search and navigation solutions provided by FACT-Finder. The results since going live on Cyber Week are a 20% increase in conversion rates compared to the previously used search provider and a 50% decrease in bounce rates. Globus Baumarkt has been awarded, for a consecutive ninth time, as the most customer-friendly DIY store by trade magazine diy and awarded number one in customer satisfaction and consulting by IFH Cologne. Globus Baumarkt’s awards show that the company is doing the utmost to meet the wishes and requirements of its customers. It was therefore important for their e-commerce team to use a more reliable and intelligent onsite search than before, explains David Büschler, Online Marketing Manager at Globus Baumarkt. Hear from DIY and Home Improvement experts to learn how new industry developments have affected their e-commerce strategy. In this webinar, you will learn how to drive sales through search optimisation and which tools maximise conversion. Guided selling is the online equivalent of an in-person exchange: interactive, helpful and intuitive. 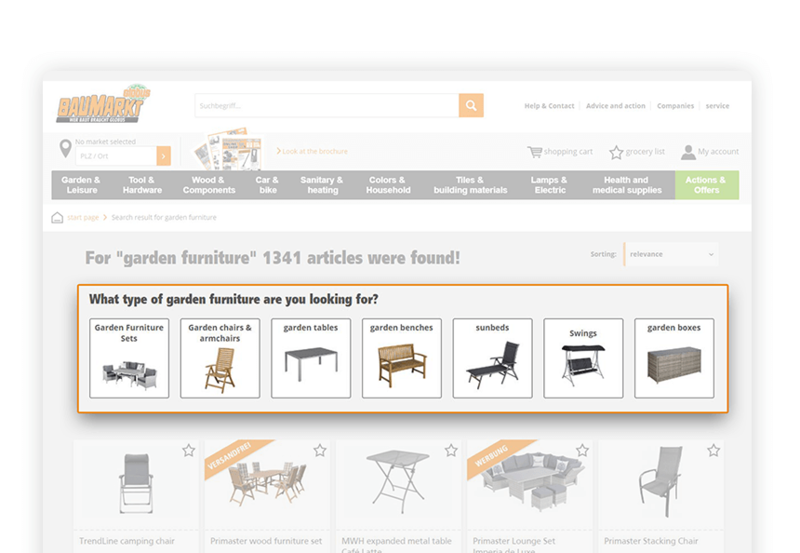 FACT-Finder provides Globus Baumarkt with another option for displaying its USP on its online shops by controlling product rankings on results pages. “When a customer makes a search request, we want the result to meet their expectations but also be in line with our sales goals. FACT-Finder’s automatic result optimization is very convenient for us because it continuously sorts the most popular products upwards. We then refine this sorting with the help of ranking rules. In this way, we determine which products appear at the top of the results. In our case these are products from advertising or products for which we offer an exclusive guarantee. We also have our own brands sorted upwards and thereby increase their sales,” explains David Büschler. Rankings can be manually defined as well as intuitively generated through FACT-Finder’s automatic search results optimisation (ASO) module. ASO is a self-learning mechanism that improves search results automatically using the click and purchase information of customers, ensuring that highly-likeable products are featured prominently. 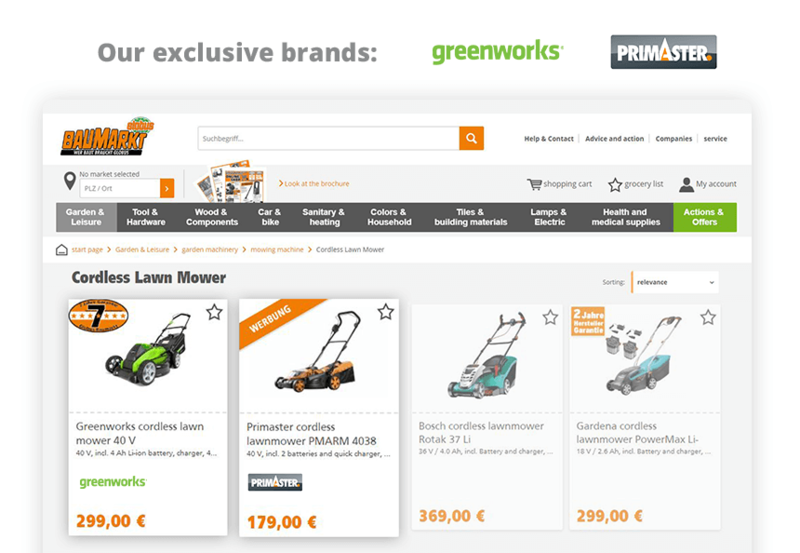 Globus Baumarkt is able to position products with exclusive guarantees at the top of the search results through the ranking rules feature. An online shop may have a lot of visitors but it’s crucial that the search engine is leading them to purchases. With online shoppers agreeing that the search function is one of the most important elements of a website, be sure that yours is error-tolerant – don’t let typos stop a sale. Once you have optimised your search and are providing customer with accurate and relevant product results, it’s beneficial to align customer needs with your sales strategy. Implementing ranking rules enables you to easily customise how results are sorted in accordance to your USP. Integration is quick and easy through a plugin developed by webweit, that incorporates FACT-Finder’s conversion-enhanced functions into Shopware environments – regardless of high numbers of individual SKU’s or complex environments. Achieve the full potential of your online store with the support of FACT-Finder’s e-commerce experts. A consultant will provide assistance every step of the way, from technical needs to adjusting module features that meet your specific objectives. 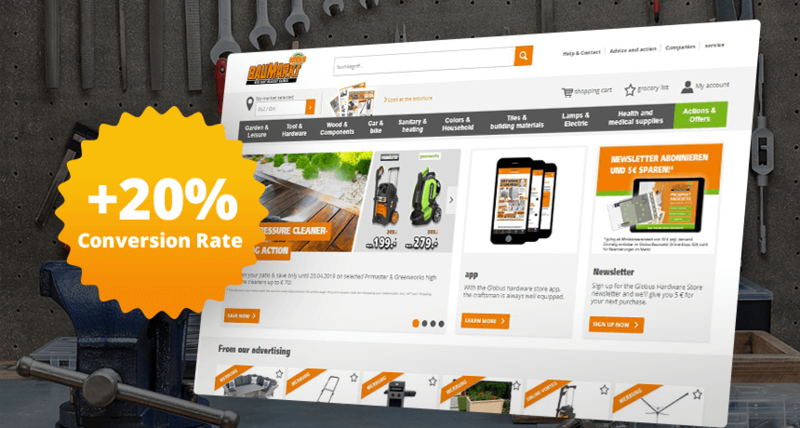 The implementation of FACT-Finder services helped Globus Baumarkt maximise the performance of their online shop, increase conversion rates and reduce bounce rates.